When Bridgeable hosts an Interactive Learning Session, we provide tools that participants can actually use and apply to their work right away – we aim to leave each session knowing that our attendees have shifted to a more human-centric mindset. At Bridgeable, we love helping organizations become more human-centered. Whether it’s training an organization on human-centered methodology and enabling them to develop internal capabilities, or prototyping strategies to use on an actual business problem. 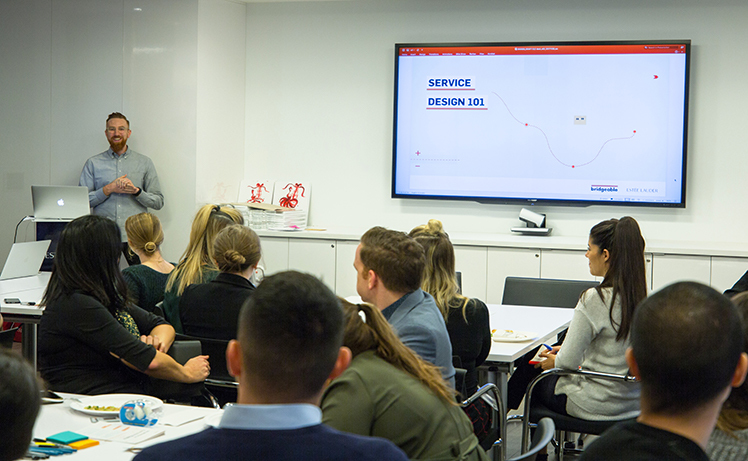 Recently, we helped The Estée Lauder Companies take a step on this journey in a very short timeframe by hosting a workshop at their offices in downtown Toronto. The Estée Lauder Companies are the leaders of the prestige beauty market in Canada, with an exceptional portfolio of 25+ brands across makeup, skincare, fragrance, and haircare. The company has embraced design thinking and were searching for ways to build human-centricity into their culture and way of working. Their Consumer Engagement Team reached out to us to help them on that journey, and we were excited to take them out of their comfort zone. We wanted to give the team a tool they could take away and use in their everyday work, so we decided to frame the session around an introduction to experience mapping. An experience map is an empathetic illustration of the user experience that’s great for uncovering gaps in user expectations and service delivery. Since we had a limited timeframe to work with, we focused on a commonly-shared experience: being a commuter on public transit. Participants were asked to think about their experiences of commuting from home to work and the various transfers they might have to take in a day. We then asked them to create an experience map based off of this journey, including transfers between streetcars, subways and walking. After mapping out the experience, they were able to identify the highs and lows in the emotional experience of commuters on public transit. After the session we heard from some attendees who said that they enjoyed “thinking outside the box to create solutions with simplicity”, and that “learning to see things from a different perspective and thinking in a different way” was a great benefit to them. When Bridgeable hosts an Interactive Learning Session, we provide tools that participants can actually use and apply to their work right away – we aim to leave each session knowing that our attendees have shifted to a more human-centric mindset. 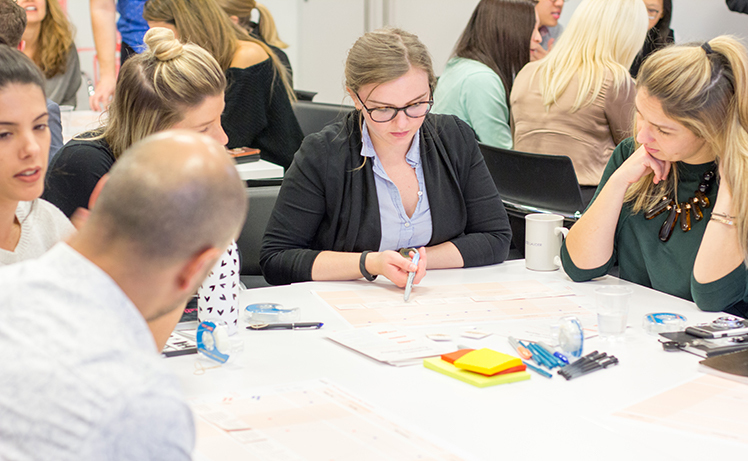 We provided The Estée Lauder Companies with a takeaway piece and the knowledge they needed to experiment with experience maps in their own work. Want to help your organization shift to a human-centered mindset? Click here to find out more about our Interactive Learning Sessions!